To make the Motherboard cake, Kim followed our recipe closely, and found a good subsitution for the Haribo Brixx, which were discontinued by the company. She used Starburst candies, which were already in the recipe, and cut them in half and piped the white icing dots. It’s a terrific substitute product and one we recommend on our “Substitutions” page. She left off the wires draped in front because she forgot to pick up the Rips Whips licorice laces at the store, but it looked just fine without it! The feedback was much appreciated – thank you, Kim! We can’t wait to see the next cake the family makes! 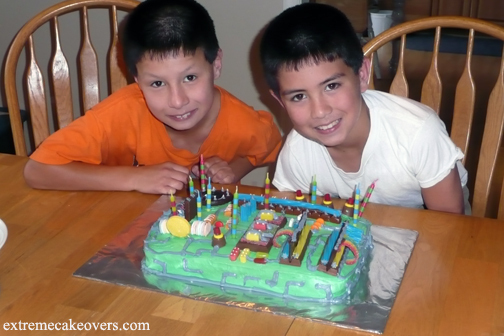 Our favorite part of her letter was seeing a photo of her twin sons all smiles with their Motherboard cake. We love her choice of candies for the cake too. We hope their family enjoyed eating it as much as making it, and we want to wish the boys a Happy Birthday! 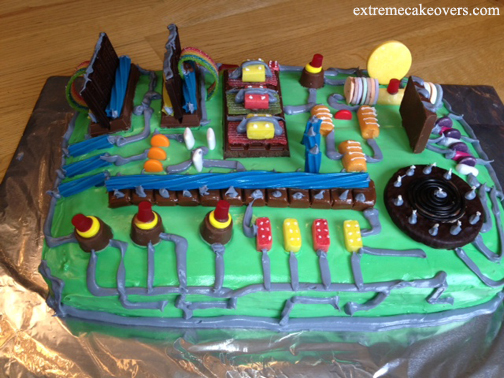 This entry was posted in News and tagged Extreme Cakeovers, Extreme Cakeovers reader cakeover, Motherboard cake, Motherboard cake from Extreme Cakeovers on September 26, 2013 by Sasha Reichart.